Anyways, after doing some calculations about the time span that those papers covered, and the amount of tuition paid during that time, I somberly informed my mother that it was about $1300 worth of paper that I was recycling, and the stack of scratch paper I was taking with me was worth another $1300. I don’t know if she found it as amusing as I did. However, speaking of my rabid conservation of scratch paper, it is worth mentioning, for those who are interested, that the preceding illustration was drawn on a piece of lined yellow paper from a legal pad. I scanned it in color, and by fiddling around in Photoshop with the “Select Color Range” function, I was basically able to clean up the image without doing much work, and color it as I normally would. 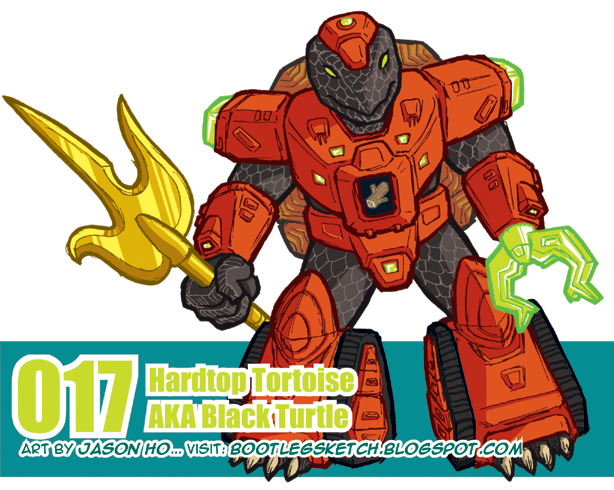 Numbered 017, Hardtop Tortoise (known in Japan as Black Turtle), is one of many characters from the toyline Battle Beasts. Fun Fact: Battle Beasts started off in Japan as a spin-off of the Transformers, and they were known as Beast Formers. When they were brought to he United States, they were renamed and marketed without any mention or indication of their relevance to the Transformers mythos.